There are many ways to introduce a new piece to a student. Sometimes we start with the sound of the piece through a recording or demonstration. Do you ever start by studying the score? 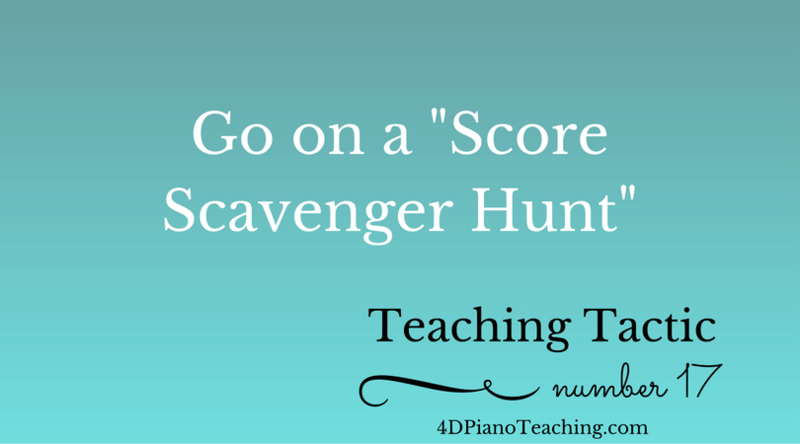 This week’s Teaching Tactic is to go on a “Score Scavenger Hunt” with your students. Ask them to find and highlight all of the dynamics in the piece. Use a different color highlighter to mark accidentals. Find articulation markings. Search the score and talk about what you see. You won’t want to do this with every new piece, but it can be a fun way to introduce a piece every once in awhile. This is also another way to work on your student’s musical vocabulary. If you ask them to find all the dynamic markings, they’re going to need to know what that means! Students can learn a lot by talking through a piece before you try to play it.